Rub up Against It, Samurai! Find new and fun ways to “rub up” against your skill. I like looking at advertisements–they are designed to get your attention. 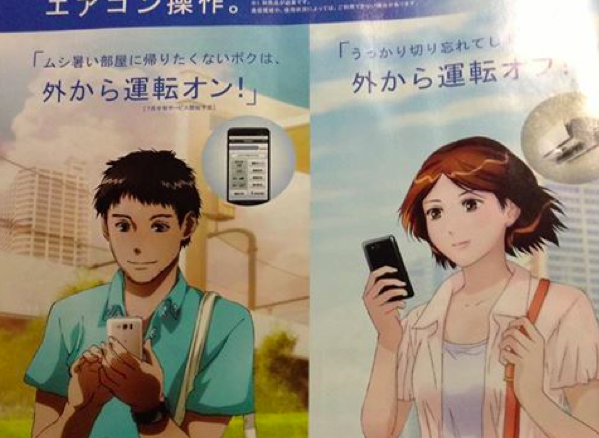 🙂 This is a Japanese ad for air conditioners you can control with your smartphone. Ads are great for rubbing up against a foreign language. Learning about guitar has been a lot like learning a foreign language to me. This means that I get many opportunities to panic. 🙂 I often feel like I don’t understand what is going on and that I need to understand everything all at once. What I really need to do is to STSU (Shut the Samurai Up) and rub up against the skill instead of trying have it all at once. I’ve been pretty systematic about just trying something with guitar. I’m following AJATT’s philosophy of “Getting Over Zero.” “Just.Do.Something.” My pull is just to stop playing because I haven’t mastered guitar, so anything that I can do for even five minutes is a huge victory. These days when I am away from the guitar (these days at the mangakissa), I’ve been watching at least five minutes of David Wallman’s “Theory and Improvisation” lessons on Jamplay.com. When I have access to my guitar and computer I either learn a small part of a lesson from Jamplay or review lessons. I use these cards to help target my practice. I simply follow the link to the lesson, watch the video or simply play using the supplementary materials on Jamplay. Just one simple way to “rub up on” a skill/game I thought I couldn’t play. To take a lot of the angst of choosing which lesson to review, I create web-based flashcards using surusu. 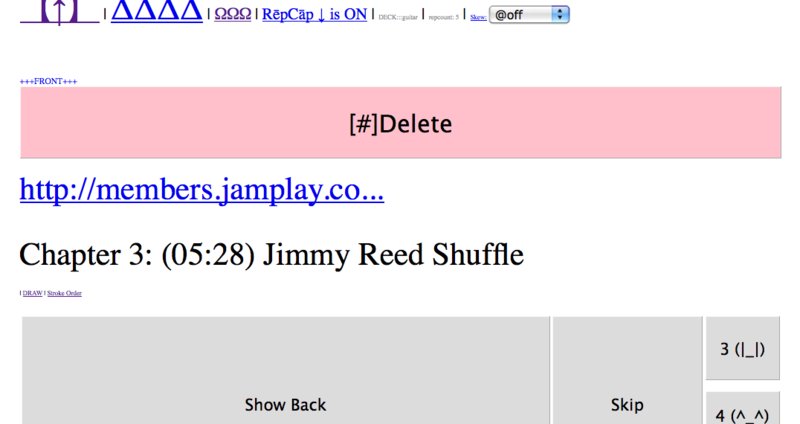 I create flashcards simply by using the titles and links to Jamplay lessons. Surusu mixes up the cards and as I pass them and grade how successfully I’ve remembered the skill or lesson. The cards come up again sooner (hard cards) or later (easily mastered cards). Having the cards prevents me from having the wasteful pity party of deciding what would be the right card to review. Since I have the guitar strapped around my neck, I also just “fool around” and try to make cool sounds. If you are overwhelmed by a potential skill, rub up against it instead trying to tackle it. Right now, I am at a mangakissa in Japan. It’s a fun way to have the office space that I have in the states. I used to be overwhelmed by the choices of Japanese manga, magazines, and entertainment that lay outside of the little cubicle where I have my computer. So I would be here in the heart of Japan, studying my Japanese flashcards but also checking Facebook every fifteen minutes. Now I don’t care if I understand everything. I look at the pictures or I look at a complicated kanji and just gaze at it~or not. Life can be a lot more fun when you are just rubbing up against it. use time limits: set a timer for five minutes: How bad could five minutes be? find light ways to be around what you don’t understand . Look at the pictures of a manga. Celebrate what you do know. Life is short. Rub up against it.